Synthesized Geranium Leaf ~ "Our synthesized geranium leaf is scientifically engineered for its green fresheness [sic]", with notes of green apple, cyclamen, geranium, coriander and musk. 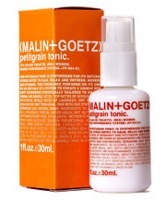 Petitgrain Tonic ~ "Our petigrain tonic is synthesized for its natural citrus notes; to calm, relax and refresh." The notes feature bergamot, petitgrain, lavender, guaiacwood and tonka bean. they really need to subcontract Luckyscents copy writers, who can make anything sound so amazing that you must have it right away! That is sooo true! The way they write is sooo lyrical and poetic…certainly a mark of evil genius. Haha! I’d actually be really interested in both of them if they fell into my lap — clinical descriptions (and green apple) aside. I just found it funny that they put “synthesized” in the name — as if 80%+ of product isn’t synthesized already. So true! I think the have the word synthesized in other product names as well. I’m fascinated by the bold use of “synthesized.” PR disaster? Translation error? Or the shape of things to come? The weird thing is that even I react negatively to this add copy, whereas Hermes descriptions of Ellena’s super-engineered lavender intrigue me and make me want to smell the result. Maybe that’s what they were going for — if so they seem to have missed the mark. As I said above, I think they’ve used it in other fragrance names — and this is very much M+G style — a sort of modern apothecary aesthetic. Is apple the fruit of the moment? It seems like so many releases have apple in it. D&G Light Blue I would love if I didn’t feel like I was rotting in a field someplace. Well, if so it’s a long moment, LOL…been around for a good long while now! I agree Loto, I love apples (especially a nice crisp tart one with some crunchy Jif ) , I love applesauce, I love apple fritters, I even love apple pie! But apple in perfume smells sour on my skin sometimes even a little like cat pee….so I pretty much run screaming from apple laden fragrances. Hey, did you see that I responded (above) to your cat story with another cat story? Daisy even helped to type her story…which would explain the typos…she hasn’t got fingers afterall. Yep. Go little Daisy, go. I want a perfume named Kitty Cat *see other post. I LOVE your gravatar! And the bottle labels make them look like something to spray in the hospital. Jessica likes lots of their products. I’ve only tried a few, and none of the body/hair stuff. Dunno about the packaging, but I rather like the straightforward ad copy. At least, it doesn’t make me roll my eyes! True, true…not the usual overly dramatic sappy, change your life with this new perfume type stuff that we’ve come to expect. Robin hit the descriptive nail right on the head when she described them as having a modern apothecary aesthetic. I like it too, including the use of the word synthetic – I’m sick to death of “natural” as a buzzword. Personally, I don’t take issue with the word ‘synthesized’; few of us here are naive enough to believe that most commercial fragrances contain %100 natural essences. 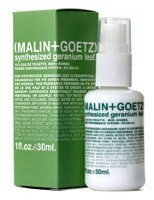 Random factoid: Malin + Goetz was started by two long-time Kiehl’s employees. I believe they became disenchanted with the brand after L’Oreal purchased Kiehl’s a few years back. If you ever get to NYC, visit their freestanding store in Chelsea (7th Avenue and about 21st Street). It’s a great little space and they are VERY generous with their samples. Musk lovers must try the Synthesized Musk perfume oil. It’s genius! I didn’t know L’Oreal owned Kiehl’s, but it’s funny, because something about M&G reminded me of Kiehl’s… and seeing Synthesized Musk on the M&G website yesterday reminded me that I want to buy one of those cheap Kiehl’s musk rollerballs.